Theory of relativity – And Why Not! Just the other day, we were remembering how I got food poisoning as a child while on vacation in Ukraine on the Azov sea. What happened was this. In communist Russia, food was a commodity not always readily available, especially in remote towns, and especially things like sugar, ketchup, tea – these things were usually bought in large bulk quantities when available, which wasn’t often. So, if a reasonable family was going on vacation, what they would do is make a parcel of supplies and send them ahead to the place of destination. Vacations used to last anywhere from 1 month to 2 or 3, and what you’d do is, usually, unless traveling with a guided tour (putevka), you’d get to a town, and take gander around the neighborhoods, ask around, and see who’s renting rooms, find the most acceptable one and rent it for the month. Townspeople knew other townspeople who rented, so if they had nothing available, they could direct you; sometimes, you’d come across the most amusing rivalries and feuds, not to mention, incredible inherent bigotry. My mom went away with a friend once; her friend was one of those very colorful Jewish ladies, with black hair, expressive eyes, big eyebrows. They went to Abhazia (a town called Pitsunda), a sub-republic of Georgia. The Georgians hate the Abhazians and the Abhazians hate the Georgians, but that’s peanuts compared to how both of them together hate the Armenians. So, mom and Masha were making their way around potential rentals when one of the hoziayka’s (hostesses) said to my mother, nodding towards Masha “You’re ok, but we don’t rent to Armenians,” meaning that my mom’s friend was clearly an Armenian based on her colorful appearance. “Oh,” said the ladies, relieved, “She’s not Armenian.” The hoziayka demanded a passport; the passport was produced; section 5 clearly indicated “JEW,” and with the pesky ethnic question out of the way, a summer-long deal was struck. The most comical aspect of this is obvious only to other people from the old USSR: you mean, a Jew is ok, but an Armenian isn’t? that’s ludicrous. With the rent you’d get a room with x number of beds, rights to use the kitchen, and rights to use the shower (usually outdoors, heated by a big tank that can be shut on and off manually). Locals made bank this way; the place we used to go in Pitsunda, the one my mom and her non-Armenian friend found, the owner lady had what amounted to a cardboard barack camp right in the garden of her little property, where pale and thin Leningradians and Moscovites shacked up and never had a better time! That turned out to be a long-term relationship, actually, because we kept coming back to the same hoziayka for several years until immigration, and sent her several references as well. As a token of appreciation for the additional business, the hoziayka looked the other way when we used extra hot water in the shower. So, when I was 6, we went to Genichesk, a small town on the Azov Sea in western Ukraine. We stayed in one of those typical garden shantytowns. And as a good mother-slash-planner, my mom sent ahead supplies, including but not limited to several cans of tushenka. 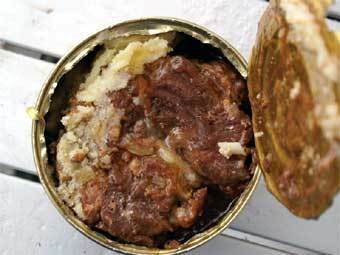 Tushenka is about as appetizing as it looks, and is basically canned beef in beef juice. You’d cook it and mix it up with pasta or noodles, and a happy family is fed for days. Two days before our vacation was over, we finished up our supplies of tushenka and noodles. Unfortunately, I think what occurred was that the leftovers were actually left over out on the stove in the balmy weather, and I became victim to whatever bacillus set up shop in the so-called-beef. One of the guests in the barack camp was a pediatrician, and she came to see me, and said I have food poisoning. Fortunately, vacation was over, and we were about to head home. Unfortunately, travel home would also happen Russia style. We traveled by overnight train. 48 hours, 2 days and 2 nights. My mom and I, in a sleeper cabin for 4. The train car had no water – the water system was broken. There was also no water on any other train car in the whole train – except the conductors’ car, but no one was allowed there except the conductors. See, even as write this, it sounds absolutely surreal to me: What do you mean, the water was broken in the ENTIRE sleeper train?! And what do you mean, the conductors wouldn’t let the mother of an ailing child borrow water? 48 hours of traveling without water, as in, no water to flush toilets, brush teeth or drink, is brutal for anyone, but for a sick kid? But that’s how it was! Mom, who at the time was all of 29 yrs old, would stand guard at the conductor car pretending to be loitering with a smoke or something, and when they’d step out, she’d run in with my little potty, or her little electric tea pot, I’m not sure, and literally steal water. And of course, I was miserable and had to go like every 15 minutes, so mom must have been hanging around waiting for water for most of the trip! What I do remember was that I really wanted to hang out on the top bunk (it’s more fun up there), but couldn’t because I had to go so often, that getting up and down from there would be more trouble than it would be worth. I also remember that for a few hours we had an older gentleman roommate, and that I was mortified. Mom was also mortified, she apologized left and right for her pooping child. The man said, oh… girls… I have 6 daughters. Please. Poop away. Then he turned to the wall and fell asleep. At one point, as a sign of rebelliousness, I did climb up to the top bunk and started coloring; it was a short lived victory because no matter how hard I worked at it, resistance was futile, and eventually, I did have to go again, and did need to be taken down from there. My meals were limited to strong tea and crackers on the advice of the vacationing pediatrician. Okay, THEN, when the hellish 48 hours were over, and we finally arrived in Leningrad, we were met at the train station by grandma and her two sisters, who swooped me up and carried me home, all the while lamenting that they never should have let her (my mother) take me on vacation because clearly she cannot be trusted with a child. I was dunked into the tub, scrubbed clean, and dressed into something white and crispy. Once ready to assume my rightful place on the couch in the big room, where I always sat when sick, I was also presented with my first real meal. A boiled potato with olive oil. I have literally never tasted anything better. You have belied tushenka! It is the best canned meat ever. You open the can and eat it all, no chance for bacillus develop (unless it already had produced botulinum enough to kill the entire family). I was doing tushenka wrong.